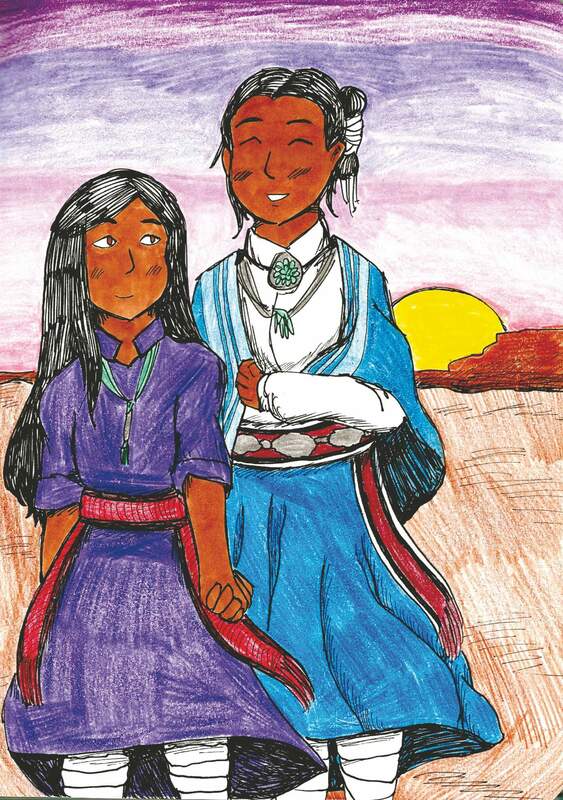 “Hozho and Yanabah,” two of Kayla Shaggy’s female Navajo characters that fall in love. There are plenty of reasons to be proud of being a Native American – a history of resilience, rich family histories, a strong sense of who you are and where you come from. DGO Mag interviewed seven American Indian artists who live in Durango and the surrounding area, each with their own version of why they’re proud to be Native, and why it’s important to create artwork that reflects their experiences, culture, and issues within their communities. Here are a few of their answers. Kayla Shaggy: I’m proud to be Navajo and Anishinabe because it shows that despite all the history, all the violence, we’re still here. I’m just really happy I’m Navajo because I can celebrate my culture and help other people. It’s just something I’ve always known as a young kid, so I always try to be happy about it. Navajo is a name people call us and what we call ourselves too, but it isn’t the name we have for ourselves. The name we have for ourselves is Diné, which can roughly translate to The People. So I’m just happy I’m a person with a community, a family, a culture, and stories I can share with other people. A.J. Nequatewa: Mostly because I know who I am, and that means not only that I know what my clans are, but I know the stories behind those clans and where they came from and what the roles of those clans were. So my mother’s clan is Salt Clan and it originated from the first puberty ceremony done by the Holy People for Changing Woman. So during that ceremony, there needs to be someone who can be thought of as a god-mom – so basically the model for that girl going through the process. Because Changing Woman was the first human going through this process, she didn’t have a baby. No babies, no nothing yet. It was just this singular being, this singular human. They needed someone to model her after, so the Holy People made a being and I don’t know if she was human or anything, but they called her Salt Woman and that’s where that clan originated from. Because we are matrilineal, she was the first Salt Clan, and then she had a baby and they were the next clan, and so forth, and now I’m Salt Clan. I’m a Salt Clan woman and that’s a real small clan, too. It’s almost one in million to meet someone else who is (Salt Clan), especially a woman because of that matrilineal line. To know where your blood is coming from – that’s what makes me proud. Antonio Herrera: It’s not that I’m proud of it, it’s just what I am. I’m Mexican American, too. I’m two cultures that are completely different but I have the same morals. But being Native American, especially the tribe that I am (Ute) – we were the last to be put on reservation. … You ever hear of the Meeker Massacre? That was us. We were warriors, man, and I was raised with a warrior mentality. Lyshawna Benally: Throughout all the history, I ended up being born of the two or three percent of the American population of Native Americans. Just learning how much people don’t know about them (Natives) or push them aside and how the government mistreated the people before. But to me, I always try to look for the positive, and the whole reason for the history is just not to repeat those mistakes again. … The cultural traditions are definitely very important to us and we should try to preserve them. Lacey Tewanema: I’m proud to be Native because of the resilience of us as Indigenous people, whether it be from Alaska to Hawaii to northeast, southeast, northwest. We’re still here and that’s where I think of it. I’m proud because my ancestors, the ones before me, they didn’t just give up. They fought for us to be here today, and so that’s why I’m proud, along with I get to represent who I am to those who don’t know much about (Natives). So I get to be able to educate them on things and subjects like we’re still here, but you guys have to break away from the stereotypes. I don’t live in a tepee and I don’t wear my traditional clothes when you’re seeing me walking down the street. I’m still in jeans and a t-shirt. Ruthie Edd: I’m proud because I know who I am. For me, that’s the biggest thing. I know where I’m supposed to be in the world. I know where I’m supposed to be, who I am, through my culture. And for me, when I look at other people through the lens, I’m like, ‘You don’t know who you are. You have no roots. You have no story. You don’t understand where you came from.’ That’s just how I choose to view the world and why I think people can do terrible things, or if they have ideas that are so conflicting with mine it’s because they don’t understand. They’re not connected to anything. They’re just trying to exist but they don’t know where they fit. If we could help people heal, to understand who they are and where they come from, regardless of whether they’re Indigenous or non-indigenous, I think that will help heal the world. That’s my personal perspective, and I think that me having a good footing in my existence is something to be proud of, and that comes from being Native. Santana Edd: I think that just being Native shows resilience and strength, and I feel like that’s important because in our history, there has been so many things that have wanted to wipe us out, to turn us into something that we aren’t. Just being here, being alive here in this moment, it shows the strength of our ancestors and what we went through. It shows that we are still here. We’re alive and we can fight for our land and for our people and for all the sacrifices that they’ve done for us to be here. Being a person of color is a statement and I feel like that’s something amazing.